The ARIES G2 is similar to its predecessor in that it's a digital to digital converter taking Ethernet input and outputting digital audio. The G2 has both wired and wireless network connectivity. In addition to network input, the G2 can access a directly connected USB hard drive and an internal 2.5" hard drive (capacity selected by the user or installed at home). The usual lossless streaming services and internet radio are of course featured as well. The 2.5" internal storage capacity is enough to house most people's' entire music collection, given that most people don't have over 2 terabytes worth of local music. 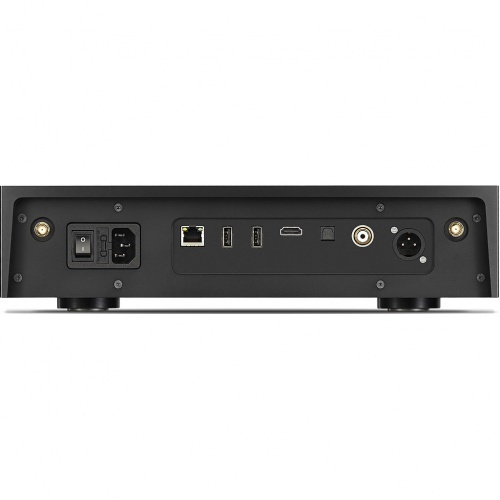 With an entire collection stored on the ARIES G2, there is no need for a NAS or general purpose computer in the audio system. Have no doubt though, the ARIES G2 is full of computing power. The Linux operating system runs on Auralic's Tesla G2 hardware platform. This platform is 50% faster than the previous version and houses twice the memory and internal storage for caching and the OS. This G2 platform has plenty of power for advanced DSP functionality such as upsampling. The ARIES G2 will handle music up through DSD512 and PCM 32bit / 384 kHz. The streaming transporter also features dual femto clocks and an EMI shielding chassis machined from a block of aluminum. This is vastly different from the plastic chassis of the incredibly popular original ARIES and ARIES MINI. The dual femto clocks are used in a way that I didn't expect. I assumed one clock was used for each sample rate family (44.1 and 48). However, according to Auralic, one clock is used to reduce jitter on the AES/EBU, coaxial, and Toslink outputs, while the other clock is dedicated to the USB controller. In announcing the ARIES G2, Auralic is also focusing on its improved Purer-Power technology and galvanic isolation. The G2 features improved galvanic isolation compared to the original ARIES because of its dual high speed galvanic isolators configured between three primary circuits (femto clocks, digital transmitter systems, and CPU circuit). The Dual Linear Purer-Power in the ARIES G2 is a step beyond previous Auralic components because of its dual architecture. The G2 has two linear power supplies to separate the processing circuit, LCD display, and internal and USB storage from the femot clocks and USB audio output. Of course these power supplies are galvanically isolated from each other to reduce EMI between them. In addition to the new Lightning Link digital output, the ARIES G2 features USB, AES, coaxial S/PDIF, and Toslink. More about Lightning Link a bit later. Like all Auralic network capable products, the ARIES G2 Streaming Transporter works very well with Auralic's custom built Lightning infrastructure with LIghtning DS (iOS), Lightning Server, and a new options web interface for system setup. Auralic's Lightning infrastructure shouldn't be underestimated. The company built it from the ground up and controls 100% of its design and owns 100% of the support responsibility. Using one manufacturer's products for both software and hardware can really streamline the resolution of customer issues in the home. Auralic is not foolish though, it has designed the new ARIES G2 as a RoonReady endpoint, should customers want to use Roon full time or simply test out its features. As usual, AirPlay, on-device playlists, memory caching, gapless playback, multi-room high resolution, and many other features are available on the Lightning platform for all Auralic products. When purchasing an Auralic product, one is buying into an ecosystem that works great in a homogeneous environment, but unlike Apple products, Auralic doesn't lock one into its ecosystem only. The aesthetic design of the new ARIES G2 is call Auralic's Unity Chassis. This housing is completely redesigned and much more elegant than the previous ARIES components. This chassis was not only designed for looks, but also for shielding, damping, and absorption with mass balancing and special foot spikes. 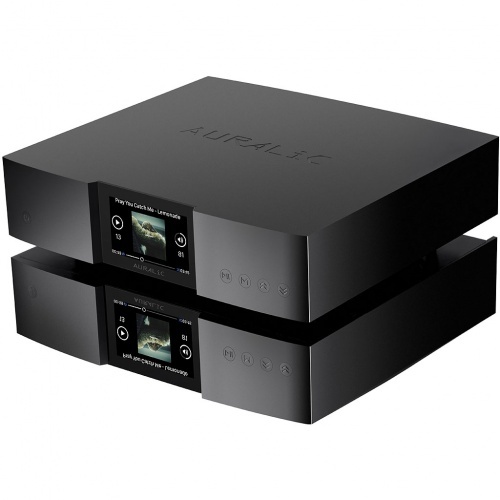 Since 2014 the AURALiC ARIES Wireless Streaming Bridge has been the leader in the world of high-resolution audio streaming, and it became the premier choice for bridging the gap between lossless digital music sources and your home audio system. Now, with cutting-edge transfer protocols, faster processing, enhanced isolation engineering and a redesigned chassis, the brand-new ARIES G2 Streaming Transporter raises the standard for connecting your musical world. 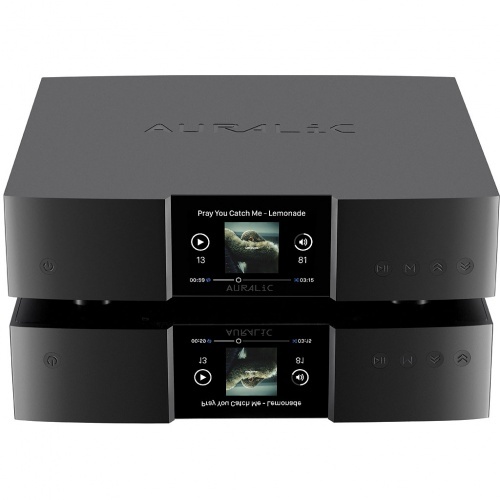 The AURALiC ARIES G2 includes all the rock-solid connectivity and one-of-a-kind features found in the original award-winning ARIES, and builds on them by introducing original engineering designs focused on isolation, separation and protection against interference. 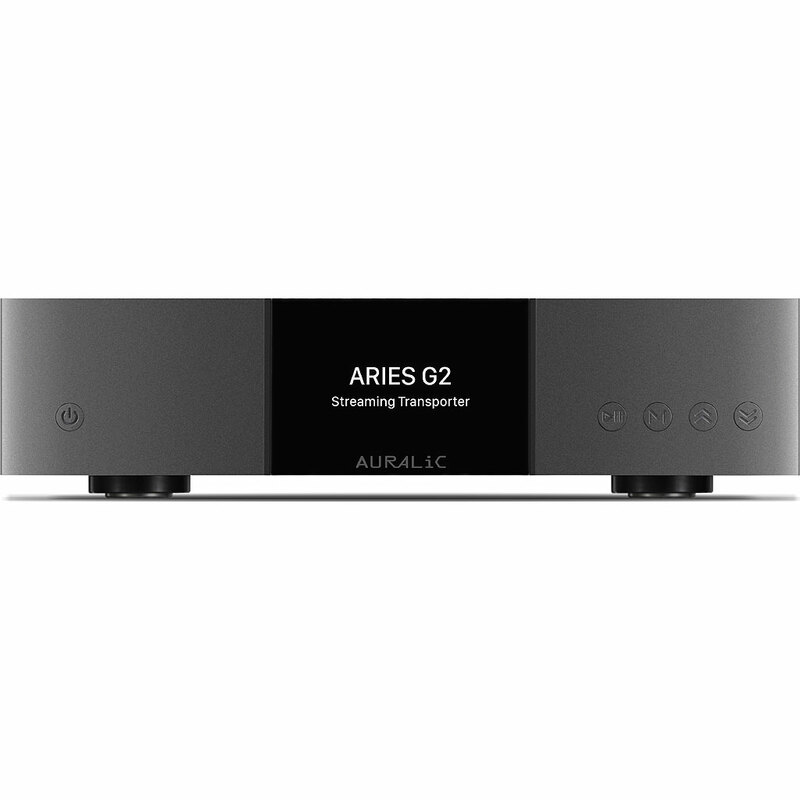 Not just a big brother to the ARIES, the ARIES G2 is an enhanced streaming device endowed with cutting-edge technologies and proprietary innovations. Whether on its own or working in consort with other G Series devices from AURALiC, the ARIES G2 is for music lovers who require the most discerning approach to modern streaming. Like all streaming-capable AURALiC products, the ARIES G2’s expansive wireless connectivity options are thanks to its native integration of AURALiC’s custom-built Lightning Streaming technology. Lightning Streaming uses existing Wi-Fi to create a dedicated music streaming network capable of wirelessly delivering the highest resolution musical formats available, up to DSD512 and PCM 32bit/384k. Lightning Streaming brings with it all the features you’ve come to expect from AURALiC streaming devices too, like Gapless Playback, Memory Caching, Bit-Perfect Multi-Room, and Upsampling. Along with the ARIES G2 and the G series of products from AURALiC, we’re also introducing a browser-based interface for configuring Lightning Streaming and its features, allowing universal access for the first time from any smart phone, tablet, or computer. In addition to compatibility with AirPlay, the ARIES G2 is a certified Roon Ready endpoint for seamless integration with Roon software, making it one of the most flexible streamers available in hi-fi. Lightning Link is a low-jitter, bi-directional 18Gbps coupling that takes advantage of highspeed HDMI-type hardware connectors to provide a superior level of transmission control, making today’s ultra-high resolution digital music shine like never before. Different from the other HDMI based I2S connection, the bi-directional Lightning Link opens the door to jitter-free operation of all the devices in your system. Clocking information from destination devices such as the VEGA G2 can drive the ARIES G2 timing for perfect data synchronization. Lightning Link also carries system control data for everything from volume control to processor engine setup, allowing all linked AURALiC devices to appear in a single, unified control interface. The AURALiC Tesla G2 Platform is the revamped heart of the ARIES G2, and it packs a processor that’s 50% faster than the Tesla G1 platform, with twice the system memory (2GB) and data storage (8GB) of the previous generation. Tesla G2 not only handles the most demanding audio formats with ease but drives the ARIES G2’s software processing engine and its advanced DSP functionality, including upsampling duties and a bigger Memory Cache for an exacting level of sonic quality and stability. As always, automatic updates keep the ARIES G2 up to date with the latest feature set and support, continually expanding its functionality and ensuring peak performance. Physically separating electrical circuits while allowing data to flow between them, Digital Audio Galvanic Isolation in the ARIES G2 offers a new level of protection against electromagnetic interference. We created two special high-speed galvanic isolators and configured them between three primary circuits in the ARIES G2. Noise-sensitive Femto Clock and digital audio transmitter systems, as well as the central processing circuit are completely isolated from each other, eliminating jitter and contributing to an unparalleled level of clarity. AURALiC’s Purer-Power technology already re-examined every detail of power delivery with innovative wiring and circuit designs based on the concepts of isolation and purification, and it was a key to the pristine operation of the original ARIES. Now, the ARIES G2 takes that approach a step further by using two internal Purer-Power linear power supplies, separating and protecting distinct power circuits from interference. The first Purer-Power supply feeds the ARIES G2’s processing circuit, LCD display, and storage – whether internal or attached via USB. The second Purer-Power pathway is dedicated to sensitive audio components such as the Femto clock and USB audio output. Both power supplies are galvanically isolated from each other to ensure zero EMI interference between them. We’ve retained the use of two Femto clocks in the ARIES G2 for incredibly detailed signal handling. The first clock drastically reduces jitter across the AES/EBU, Coaxial and Toslink outputs. But timing issues can affect sound quality from output via USB too, so there’s a second Femto clock dedicated to the USB controller in the ARIES G2. No matter which route you choose, you’ll benefit from extremely precise timing and low jitter thanks to these superaccurate clocks. The ARIES G2 is housed in a completely redesigned enclosure – the Unity Chassis. It’s machined from a single billet of aluminum and specifically designed for the premium lineup of AURALiC G Series products, right down to mass balancing and the shape of its foot spikes. The Unity Chassis excels at shielding the inner workings of the ARIES G2 from EMI and providing superior dampening and absorption, reflecting the obsessive attention to noise reduction throughout the G Series. The ARIES G2 connects to all your favorite sources of high resolution digital music, no matter where they are. But if you prefer to store your music locally, there’s an internal drive bay capable of housing any 2.5” HDD/SSD. With an internal drive installed the ARIES G2 becomes a powerful and flexible streaming music server, ready to deliver an exceptional audio experience.